Each year, ISPO Munich (February 3–6, 2019) attracts more than 2,800 international exhibitors and over 80,000 industry professionals to the Bavarian capital. Trade visitors get an exclusive overview at the highlights of the upcoming sporting year. Since 2018, end consumers have also been able to take advantage of the trade fair: ISPO Munich Sports Week (February 2–9, 2019) brings the passion for sports to downtown Munich and invites sports enthusiasts to take part in and try out numerous events. A highlight of the sports week is the ISPO Munich Night Run presented by BUFF®, which takes place on February 2 at the Olympic Park. 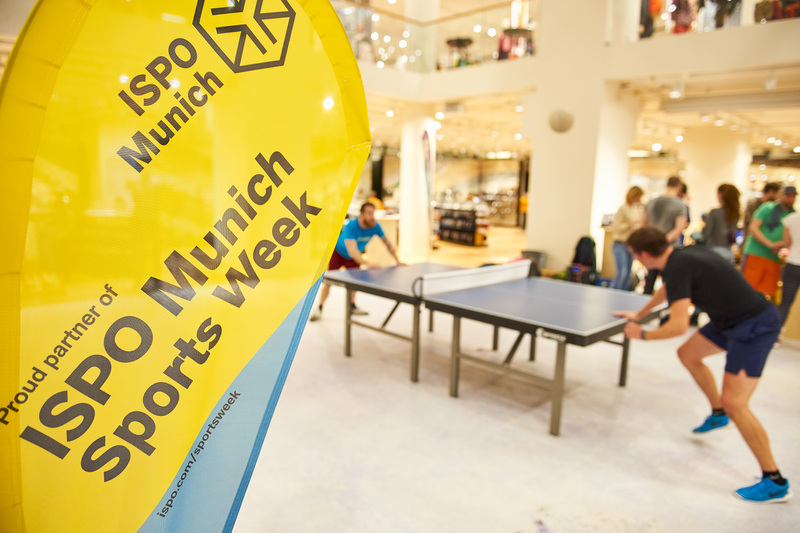 From February 2–9, the second ISPO Munich Sports Week will take place in Munich. Picture Download: From February 2–9, the second ISPO Munich Sports Week will take place in Munich. Workshops, talks, and product testing activities—following its successful launch last year, ISPO Munich Sports Week will once again transform Munich city center into one of the largest sports grounds in the world in 2019. “For a whole week, retailers, brands, sports clubs, and other players from the sports industry will be bringing the trade fair’s passion for sports to the city and involving the consumer,” explains Markus Hefter, Exhibition Group Director for ISPO Munich. With new activities and free events, the program for ISPO Munich Sports Week has become even more extensive. One of the starting points for the numerous sporting events is the sports retailer Globetrotter at Isartor. It is from here at 2:00 p.m. on February 2 that the Sympatex plogging event will commence. Participants will learn from plogging inventor, Erik Ahlström, in person what plogging (a made-up term from the Swedish word “plocka”—“to pick” in English—and “jogging”) has to do with a clean environment and sustainable textiles. With Ahlström by their side, they will then continue with a plogging tour through downtown Munich. On Sunday, February 3, a real cinematic adventure awaits the residents of Munich: ISPO and SportScheck will be presenting the premiere of the new Nuit de la Glisse outdoor movie MAGNETIC. The audience can expect impressive shots of nature as well as background information from the director Thierry Donard and the two main actors Tom Barrer and Toby Cunningham in person. On February 4, CrossFit eo is inviting people to get involved in a CrossFit for Newbies course at reduced rates. In time for winter, Mammut is organizing a free Snow & Safety Workshop on February 6. Here, participants will learn all about safety on the mountain—whether for ski tours, freeriding, or snowshoeing—and can get to grips with avalanche equipment. Looking ahead to spring and the start of the cycling season, the Rose bikes store will be offering a breakdown repairs workshop for bikers on February 9. Sports enthusiasts can find the complete program with all events and details at ispo.com. Another highlight is the ISPO Munich Night Run presented by BUFF®, which takes place on February 2. More than 500 people participated in the running event in 2018 and over 700 runners are expected this year, including professional athlete Florian Neuschwander. In addition to two urban trail runs over 5 or 10 kilometers, children will also have a chance to get involved in the first Kids Run (8 to 14 years). In addition, the “GORE-TEX 1 Mile Uphill Challenge” will be encouraging team spirit with a relay team challenge on the Olympic Mountain. In the afternoon, participants can enjoy an extensive supporting program and hands-on activities in Munich's Olympic Park. The start and finish area for the runs is located on the forecourt of the Olympic Ice Sport Center (Willi-Daume-Platz). All information about registration, participation fees, and travel information is available on the website.